Every Dawg has a Husky Card and now it's even more useful. Use your Husky Card to pay for all Dawg Prints services. It's easy to add value to your Husky Card at http://hfs.washington.edu/husky_card or visit the Husky Card Office located in Odegaard, Husky Card station in the HUB, Allen North Lobby, Health Sciences Library, or Odegaard First Floor. 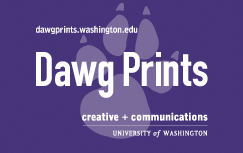 With a Departmental Husky Card your staff can purchase Dawg Prints services at any of our locations across campus. Housing and Food Services (HFS) can close your account if your card is ever lost or stolen and can even restrict where your card is accepted. You also have the ability add value to your Departmental Husky Card from your computer at any time and monitor online when and where the card is used. To request a Departmental Husky Card, contact HFS at huskycrd@u.washington.edu. Please include your budget information, the number of cards you would like issued, and the monetary value on each card. HFS will process your request and contact you when the cards are ready. If you are visiting campus and don't have a Husky Card, purchase a Dawg Prints Card. We guarantee that you will get a quality print every time. If you don't, we'll make it right.